After a long separation, Blanche Dubois visits her sister Stella, who lives in a working class neighborhood of New Orleans where she is married to Stanley Kowalski, a handsome and impulsive man who likes to drink and gamble. Blanche criticizes her sister for marrying beneath her, while admitting she has lost the beautiful family home of Belle Rêve. Stanley, upset to see that his wife’s inheritance has been squandered, remains unmoved by his sister-in-law’s simpering and discovers that she lost her job as a teacher for having an affair with a minor, then got by as the client of shady hotels, living off the kindness of certain gentlemen. Blanche’s mental health, profoundly affected by a youthful love that came to a tragic end, falters on the contradiction between the image of the pure woman she tries to project and the reality of her own decline. “…Exciting is an equally understated term for “A Streetcar Named Desire” created by his Mabou Mines company on a commission from the Comédie Française for its prestigious Salle Richelieu. How indeed to qualify this project which has already been inscribed in the annals of the 430 year old home of Molière? It is a landmark and a watershed for starters in that the production breaks down a highly symbolic barrier: Tennessee Williams becomes the first American and even the first non-European author to enter the repertory of “le Français”, and “Streetcar” takes its place among the 2,662 works that the Troupe is authorized to play. Unconventional is what the Comédie Française gets with its choice of Mabou Mines, a leader in New York experimental theater for over 40 years and whose early identity was shaped by conceptual art, performance and the minimalist work of composer Philip Glass, a cofounder. Led by Breuer, whose interests range from fairy tales to Bunraku marionettes and Greek drama, Mabou Mines has received innumerable national and international awards (11 Obies to Breuer alone) for productions like “Mabou Mines Dollhouse” (where Torvald was played by a little person), “Peter and Wendy”, a puppet retelling of “Peter Pan”, and “Red Beads”, written by Breuer and designed by Basil Twist with merely fabric and wind. 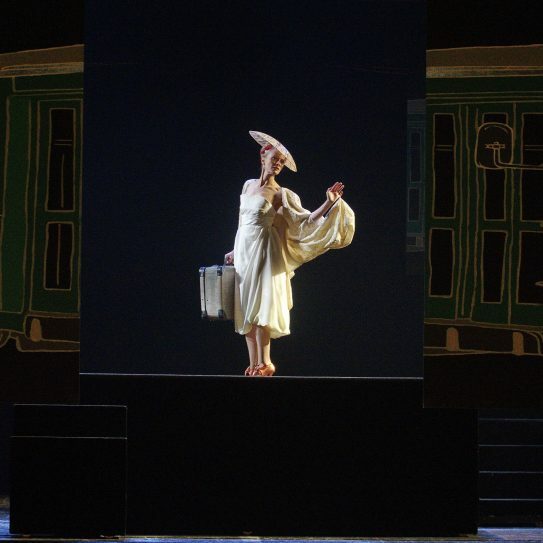 The intended marriage of all the creativity of Mabou Mines with all the traditions of the Comédie Française could have ended like the collision of a sportscar and a freight train but this “Streetcar” never belches smoke or even loses steam. “PARIS — The gilded and red velvet Salle Richelieu is the most hallowed stage of the Comédie Française, the three-centuries-old acting troupe. It has survived war, fire, political turmoil, financial difficulties but only now is it encountering its very first American play.